Founded in 1865, Ithaca, NY-based Cornell University is recognized worldwide for its academic excellence and leadership. 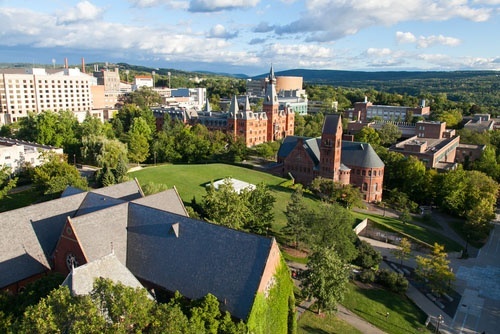 Currently ranked #15 by U.S. News and World Report’s “Best Colleges and National Universities,” Cornell operates 14 colleges and schools, including the undergraduate College of Arts and Sciences and College of Agriculture and Life Sciences and several distinguished graduate schools. The rural setting of Cornell’s 745-acre campus in Upstate New York, however, presents unique challenges when it comes to managing the university’s 16,000+ Avaya telephones—including a mix of CM 5.2 and CM 6.3 systems. After years of working with Avaya Direct, Cornell decided to seek a different, more affordable, maintenance and support option from a more responsive provider. After an exhaustive RFP process, Cornell chose Continuant, largely because Continuant offered not only remote support and field technician availability but also a large team of highly experienced Avaya engineers. Because Cornell’s future plans include migrating to a unified communication solution from either Cisco or Microsoft, the university plans to continue working with Continuant to keep their extensive Avaya telephone system working well now and throughout the transition. Continuant is currently consulting with Cornell, providing budgetary options and unified communications system design for both Cisco and Microsoft solutions. The options being evaluated include both on-premise and cloud-based solutions – Cisco or Microsoft UCaaS, powered by Tata’s global network.